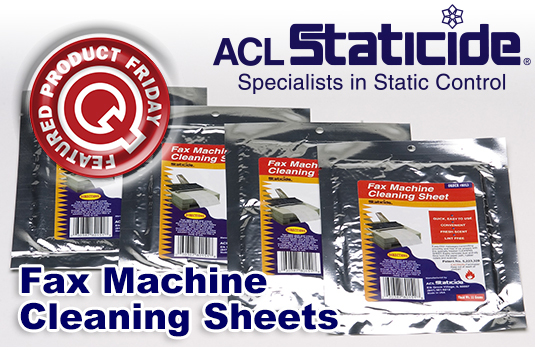 Save 41% off the MSRP on the ACL Staticide’s Fax Machine Cleaning Sheets (1/Pouch, 4 Pouches/Bag, 12 Bags/Case) when you use our FPF091815 Coupon Code (auto applied). This Featured Product Friday (FPF) promo is valid from today, September 18, 2015 through Sunday, September 20, 2015. These ACL 8015 4PK Cleaning Sheets offer lint-free cleaning to remove dust and film from the paper path, rubber rollers, and scanner of your fax machine (one sheet equals one cleaning). Avoid unclear faxes and failed transmissions. This 3-day limited-time offer is unlimited. Use the code as many times as you like while it is valid—and we encourage you to share the code with your friends and colleagues. For further questions about Featured Product Friday, please read our informational blog post, call us (800-966-6020), or send us an email. Please note: This promo is valid only at QSource.com and expires on September 20, 2015.